Canadian Taxpayers Federation’s Racist Campaign? This landed in my inbox today and I thought it best to share it out. Please note that in no way do I or have I ever supported the Canadian Taxpayers Federation. How do you feel about a politician from a Native reserve of 304 people receiving a $978,468 tax free salary? BTW … that’s equivalent to $1.8-million if they lived off-reserve and paid taxes. Or what about a reserve politician from a community of 615 making $567,935 tax free? If those true stories of tax dollars being spent wildly on reserves makes you sick to your stomach, then take note of the cure: Bill C-575. It’s a private members bill in Ottawa right now that aims to give the federal government the legal authority to place reserve politicians’ salaries on the internet each year. That would bring reserve politicians in-line with all other politicians in the country who have to disclose their pay to taxpayers. Bill C-575 was in response to the Canadian Taxpayers Federation helping band members blow the whistle on case after case of reserve politicians living high on the hog while their people suffered. The CTF has learned that over 600 Native politicians in Canada are earning a taxable equivalent of over $100,000 to govern average reserve populations of 1,142 – yet the Department of Indian and Northern Affairs does not have the legal authority to release the names. Bill C-575 – supported by the government – would change that. But in order for it to pass, it must be supported by Opposition MPs. Currently, NDP Leader Jack Layton and Liberal Leader Michael Ignatieff are opposed to these salaries being disclosed. Bloc Leader Gilles Duceppe has yet to declare a position. We need to send them a message: let Natives and non-Natives see how tax dollars are being spent on reserves. The status quo is unacceptable. Pass Bill C-575. You may hear non-sense excuses about privacy matters and other gobbledygook, but at the end of the day, we’re talking about public funds – salaries should be made public, especially when those dollars are supposed to be helping on-reserve citizens. PS: The only reason that wasteful spending like this comes to light is because of your donation. If you like what the CTF is doing to blow the whistle on abuse of your tax dollars, please consider making a donation. 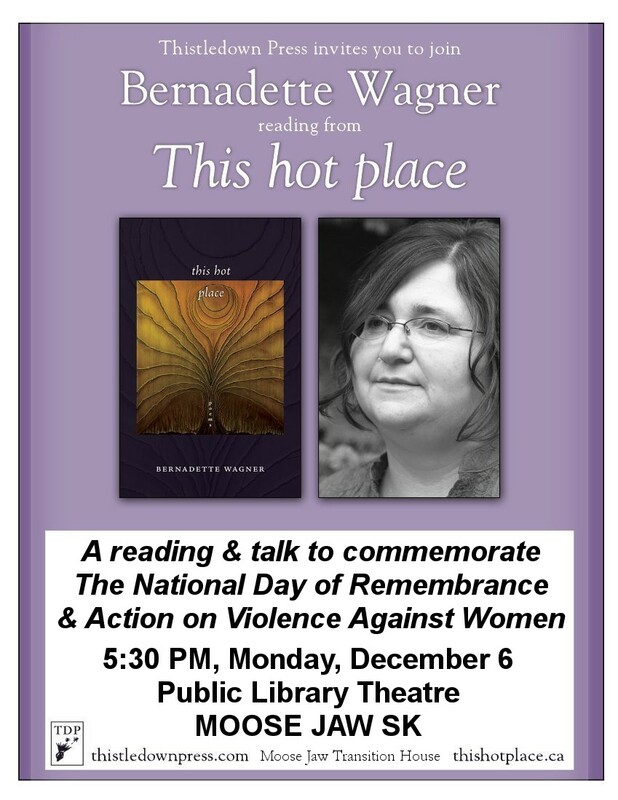 I have been invited to be the guest speaker at the Moose Jaw Transition House event to commemorate The National Day of Remembrance & Action on Violence Against Women. When I received the invite to this event I thought, Wow! Yes! And then I thought, Why me? I’ve never used the services of a T-House or a shelter. I’ve never been harmed, not really. And then I stopped myself, because I realized that yes, I have been harmed. I have been sexually abused and sexually assaulted and I have stories — poems — which relate to those experiences. Yes, they’re embellished, but still, they speak truth, truths which hold true for many women, I’m sure. We are victims of violence, yes. And if we can live past the abuse and assault, we become survivors, too. We can live rich and full lives. And so, the focus of my talk will be on our survival and it will be a talk that is both personal and political, prosaic and poetic, as well as earthy and spiritual. And who knows, I might even break into song! I hope you can be there.